Lenovo is pushing the limit with their newly cemented #2 global PC manufacturer position, launching four convertible laptops this month. The laptops are designed to help people “do” more, offering touchscreens, and the foldable flexibility to easily transform them from laptop to tablet and any position in between. 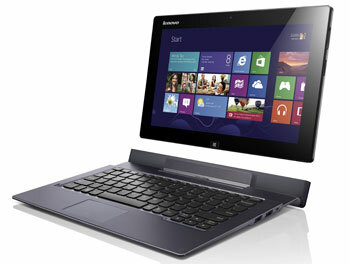 The IdeaPad Yoga 13 has a specially designed hinge that allows you to open up the laptop a full 360 degrees until flat. The monitor is also a touchscreen, so in this position you can use the Yoga as a tablet. The top and bottom of laptop have a rubber edging that grips the tabletop if you bend the laptop backwards into a "V," so it will stay in the so-called “tent mode” without sliding flat. You can also place the keyboard face down and prop up the monitor in "Stand Mode"–with built-in gesture technology you can flip through slideshows and photos without the need for the keyboard. 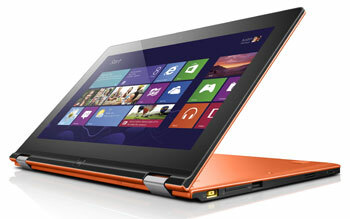 The Yoga 13 will run the new Windows 8, and you can reserve yours at Best Buy starting on October 12th, although it won't be available until October 26th. The Yoga 13 retails for $1,099. The Yoga 13's smaller cousin, the Yoga 11 runs Windows RT, a scaled-down version of Windows 8 built for low-power ARM processors, and will be available December 2012 for $799. Lenovo’s ThinkPad Twist is a convertible Ultrabook that can bend into stand mode, fold into itself for tablet mode, or the monitor can twist so you can simply flip the monitor 180 degrees for presentations or displays. As it’s a part of the Lenovo Ultrabook family, it’s a sleek laptop at only 20mm thick. The Twist will retail for $849 when it hits the market on October 26th. Lastly, the IdeaTab Lynx tablet rounds out the new collection of Lenovo convertibles by doing something that neither the Yoga or Twist can–separate into two pieces. The 11.6-inch screen completely detaches what's essentially a keyboard dock. Depending on the use, the Lynx can be used as a tablet only, or as a fully functioning laptop. There's a big advantage with the docked mode, battery life. 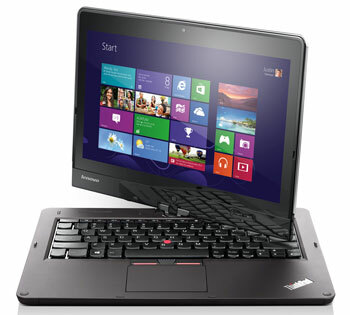 Lenovo is claiming it can last 16 hours as a whole unit, or several hours less as just a tablet. The Lynx can be purchased as just a tablet for $599, or with the keyboard doc for an additional $149. Both will be available in December 2012.